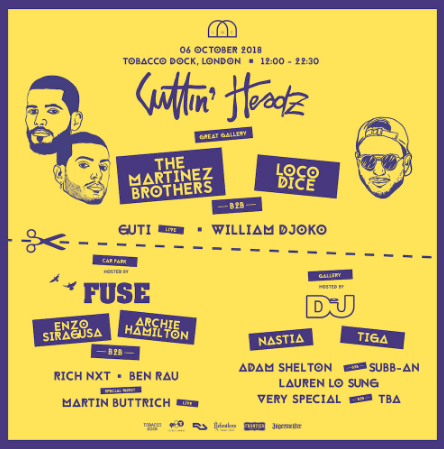 Nastia, Tiga and Lauren Lo Sung are among the new artists added to the bill for The Martinez Brothers' Cuttin' Headz party at London’s Tobacco Dock this October. Also added to the already stacked line up is a b2b set courtesy of Adam Shelton and Subb-an. They will join the likes of the Martinez Brothers b2b Loco Dice, Guti, William Djoko for the event at the LWE venue on Saturday 6th October. DJ Mag will be hosting The Gallery room of the event which will be hosting Nastia, Tiga, Lauren Lo Sung, Adam Shelton b2b Subb-an as well as some very special surprise guests TBA. Tickets for LWE Presents Cuttin' Headz can be purchased here. Full line-up details can be seen on the flyer below.